Kartemquin Films' 50th Anniversary events are full of immersive experiences in Chicago and at major cities across the nation throughout 2016. The theme of this celebration is “Democracy through Documentary.” View a full calendar of 50th Anniversary events, including screenings, retrospectives, masterclasses, broadcasts, and online streaming, and our unprecedented retrospective exhibition at Expo 72 in Chicago from May 20 - August 20. Join the conversation by using #KTQ50. Join us here to watch all our films including one for free each week throughout 2016, or stream the entire VHX Kartemquin film catalogue for 1 year for $50. That’s every Kartemquin Film in 12 months so treat yourself or that special someone! While you’re at it check out our amazing sale . This December we are offering 50% off everything in the Kartemquin store. 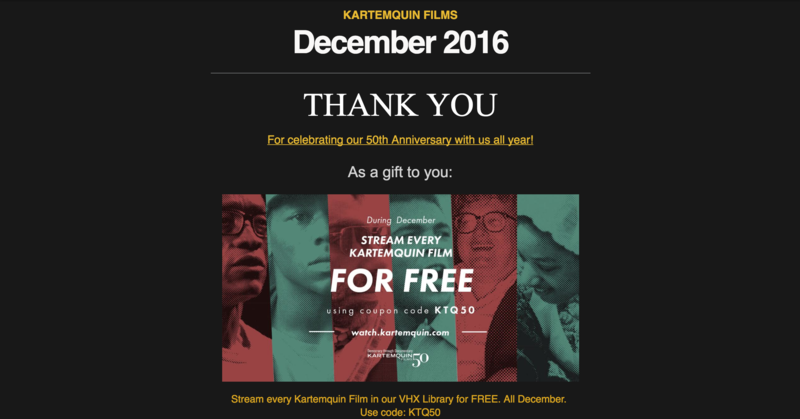 But there’s even more: from now until January 1st, purchase all four Kartemquin: The Collective Years DVD's for $50.00, including a limited edition booklet detailing Kartemquin's history over the past 50 years. Applications due today for Kartemquin’s Internship Program . Acclaimed by students, colleges and the film industry, interns are quickly immersed in all aspects of the organization and often go on to become our future filmmakers and staff. 2017 Diverse Voices in Docs Applications are open! Deadline 12/19. Now in its 5th year, Diverse Voices in Docs (#DVID), provides professional development and mentorship for documentary makers of color. Announcing Stranded by the State, a new web series examining the human impact of Illinois' budget crisis. A collaboration between In These Times and Kartemquin Films, Stranded by the State is directed, edited and produced by Kartemquin associate Liz Kaar. Raising Bertie will be coming home for TWO FREE public screenings at Bertie High School in Bertie County. The film's subjects will be present, with panel discussions following both screenings. In the Game goes global! Following In the Game's selection as one of the 10 films to participate in the American Film Showcase(AFS), the United States' premier film diplomacy program, the film and director Maria Finitzo are slated to travel to Tajikistan, India, and Morocco beginning in December 2016. Saving Mes Aynak won both the Grand Jury Prize and Audience Award at the 6th International Archaeological Film Festival of the Bidasoa. WTTW will broadcast Kartemquin’s Mapping Stem Cell Research: Terra Incognita at 10 PM on Thursday, November 15 as part of a year-long series celebrating our 50th Anniversary. A collaborative center for documentary media makers who seek to foster a more engaged and empowered society, in 2016 Kartemquin celebrates 50 years of sparking democracy through documentary.Kartemquin is a 501(c)3 not-for-profit organization based in Chicago. Please visit www.kartemquin.com for more information. Thanks!